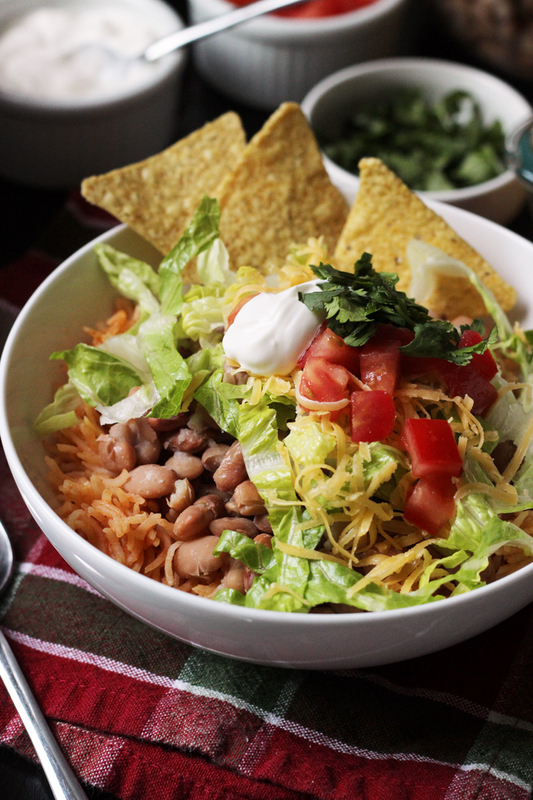 Pinto beans and rice are a good cheap eat, especially when you top them with chips, salsa, and some other goodies. They make a filling meal to help you save money and eat well. We eat homemade pinto beans and rice at least once a week for dinner. Sometimes they are side dishes, but often they make the bulk of the meal. While I sometimes lean on canned beans, I save money when I cook my own pinto beans to serve alongside “from scratch” Mexican rice. No boxed rice mixes around here! We’ve found that these homemade varieties taste better than the canned and boxed versions, and generally the homemade version is less expensive as well. What Do You Eat With Rice And Beans? In fact, during very lean times, like when we were paying off a ton of debt, I served beans and rice three or four times a week! Sometimes we might have just beans and rice and perhaps a little cheese. But know that this humble meal can turn into something special when you “dude it up” with toppings. I make my own fresh salsa because it’s very inexpensive. I buy the other toppings on sale whenever possible. That’s some good cheap eats, my friends! You can vary your toppings so much, it really never has to be the same meal twice. However, my people prefer cheese, salsa, sour cream, and chips at the very minimum. On your beans and rice buffet, you can also lay out small bits of leftover cooked meats. They’ll get used up in a flash. Other toppings you might want to consider: guacamole, avocado, lettuce, chopped onions, fajita vegetables, chopped tomatoes, cilantro, and hot sauce. 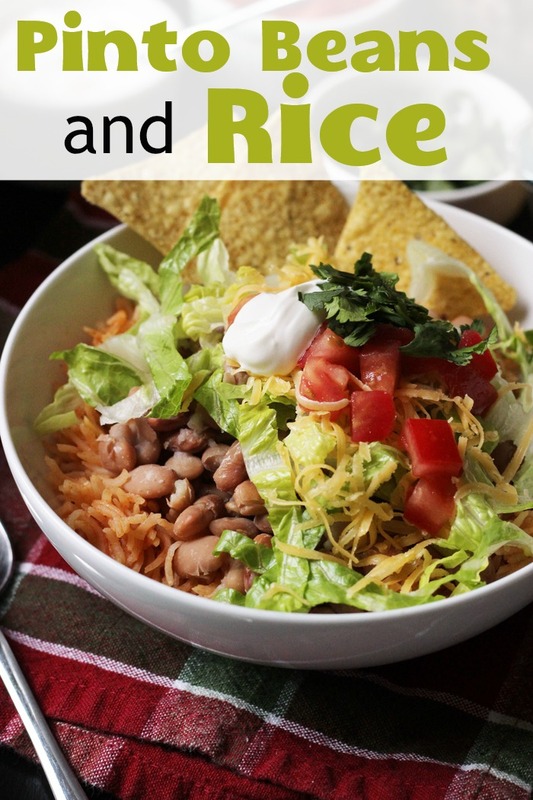 Beans and Rice make a perfect Bowl Meal! 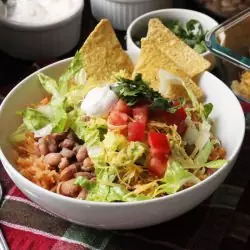 Pinto beans and rice are a good cheap eat, especially when you top it with chips, salsa, and some other goodies. It’s a filling meal to help you save money. Lay out bowls of each of the ingredients. 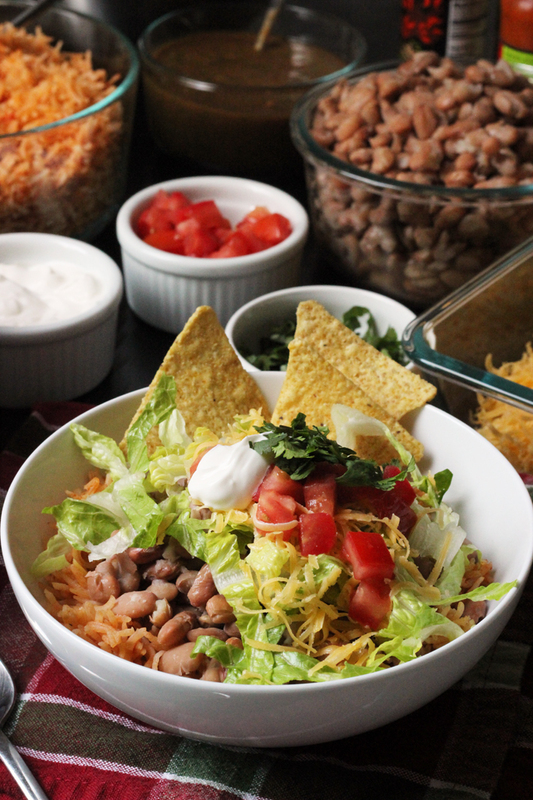 Allow diners to layer beans, rice, and toppings in each bowl or dish, according to tastes. Originally published June 2009. Updated April 9, 2017. I hope you see this message, since it is on an older post of yours. I am very intrigued by this “recipe.” I’m curious about a couple things: Do you know if brown rice would work as well in your mexican rice? It takes twice as long to cook of course, but surely it would still cook the same? Of course, it’s not authentic “mexican” but it is healthier anyway. 🙂 Also, do you season the pinto beans at all, or do you just throw them on top of, or mix them into, the rice? Thanks for any help you might have. I’ve been following your blog for a while now, really do enjoy reading your stuff! Yes, I get notifications on all comments. 🙂 I have been using brown rice in this for the past two years. My family doesn’t love it as much. It does take longer to cook, but it is still good. The texture is a little stickier, though. As for beans, I season them the way they are in the recipe, but usually not more. With all the toppings, everybody makes his own like he likes it. And yes, it’s a non-recipe, isn’t it? Hi! I have to say that I love this website! You have helped me tremendously this week. Before that, I had a nice meal plan for my family, but after so many weeks and months we were getting so tired of eating the same things. I have 4 children and they all have different wants when it comes to food, so it can be frustrating to cook for them. But, they have really liked all of your recipes and ideas that I have implemented. Especially the pizza night and sandwich bar. Those were a huge success for me and now I am going to begin the beans and rice your way. It sounds great to me, as I love mexican food, and they like it too! Thank you so much! 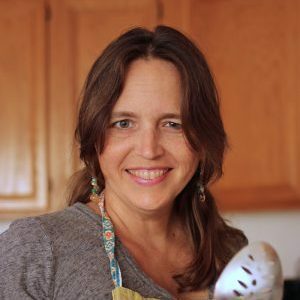 have you tried using a pressure cooker for rice and beans- the pressure cooker has been a great time saver for us, but i understand that having the time to use it depends on on your individual needs. just a suggestion. @bob taylor, I haven’t. I have a fear of the pressure cooker. 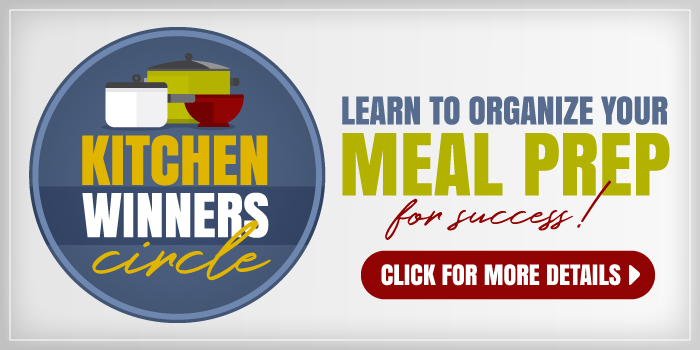 i encourage you to take a closer look at learning to use a pressure cooker– pressure cookers are very safe to use, and very safe to use- you would have to be doing a myth busters test to actually blow up a pressure cooker to over come all the safety features that are built into modern pressure cookers. here’s one link that we have found very informative: http://missvickie.com/workshop/stepbystep.html. 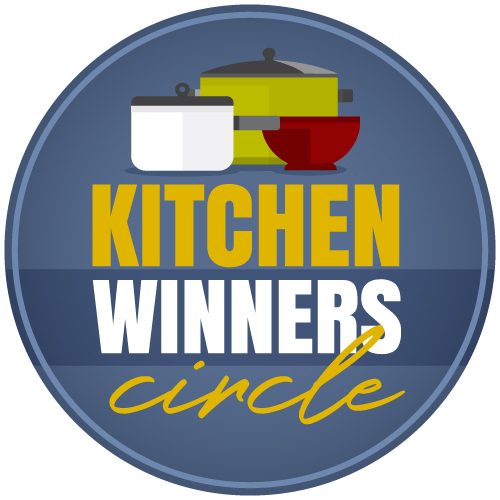 pressure cookers can save you a lot of time, especially if you are already using a menu. For doing dry beans quickly, a pressure cooker is great. It works nicely on meat too. A 2-lb round steak done in under 30 min.? Yep. And she’s right, on newer models there are so many safety features you’re not going to hurt yourself with it. On older models, pay attention to keeping the vent clean, don’t overload the cooker, and you’ll be fine. I’ve managed to blow the pressure plug twice (2 different cookers), making quite a mess both times, but nobody was hurt and that’s out of nearly 30 years of using the thing (one of those happened when I was maybe 15). I have adopted your slow cooker pinto beans and Mexican rice as part of our weekly meal plan.Today I had to laugh because something came over me (an episode of America’s Test Kitchen) and I made the Cooks’ Illustrated version of Cuban rice and beans. This one pot meal has taken me, so far, three hours to make, with 30 minutes in the oven to go! Not counting the soaking of the beans overnight. My kids have had about four times their regular amount of Nick Jr. and PBS Kids – this better be good! It made me thank God for you and your delicious – and easy to make with three little ones under foot – recipes. @Christine, ha! I remember those days of spending way too much time on new recipes. I imagine that those beans were awesome, but CI definitely is time intensive. We have begun eating beans and rice every Sunday as part of our pantry challenge. Even though January is coming to an end we will continue to eat rice and beans on Sunday. I may have to start being a little more creative though so I look forward to searching your sight for ideas. By the way our pantry challenge was a huge success! @dawn, this is a great meal to add little bits of meat (maybe from other meals) or yummy toppings like salsa, guacamole, fajita vegetables, etc. I took your idea and it was terrific. I made Mexican Rice, put warmed pinto beans on top, that was delicious by itself. But, then we added lettuce, cheese and salsa. Definitely will be a regular around here. Thanks for the idea. @Melissa, that’s a go-to around here. I really enjoy many of your recipes:). It is a bit embarrassing to say but we are very poor, it’s so nice that you share your recipes for REAL food for people on tight budgets! Thanks again! I’m Seventh day Adventist. We call it haystacks and often eat it for lunch on Saturdays after church. The beauty of it is that everything can be done ahead of time so you just pull things out of the fridge and the beans can be sitting in the crock pot waiting so they’re already heated. Definitely a favorite around here!